Audrey Homan is a Vermont-based digital content producer and mediamaker. You can find her current CV here. For the past eight years, she has written and produced media for the Tarrant Institute for Innovative Education at the University of Vermont. She got her start in editing and media production at the Cal Aggie Alumni Association and UC Davis Magazine, at the University of California, Davis. Before that, she was a grants accountant, research coordinator, tacoista and memorably, a late-shift veterinary janitor. In her free time she reads, knits and hosts late-night radio shows — sometimes simultaneously. 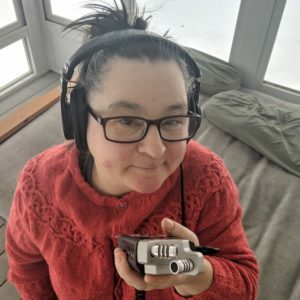 She’s also involved with several animal rescue organizations and teaches podcasting and audio production workshops locally. You can find her online at Goodreads and Ravelry.